The Lion SD 50 security Door is not just simply any security door, it is a gateway to better, more efficient business. Steel security vault doors are some of the most reliable and fool-proof way of keeping your resources safe. With news of break-ins happening on a regular basis, it is never a bad thing to invest more in security. Keeping your valuables and loved ones safe are the most important reasons as to why people invest in a sturdy vault door. In terms of businesses, many banks and shops also use these doors as an added layer of security to protect valuable resources. At Lion Steelworks, we have always been known as one of the best steel security vault door manufacturers in Malaysia. Earning an esteemed position within the industry, Lion Steelworks is synonymous with reliability and unrivalled quality. Our decades of experience have allowed us to master steel and its properties. This is why we are able to maximize the properties of steel and give our clients unparalled quality. Our Lion SD 50 Security Door is more than just a barrier or security door. It is a piece of equipment that is uniquely designed to assist you and your business. A sturdy door paves the way for better security and that is what every business needs in order to thrive. The Lion SD 50 Security Door is made from only premium grade materials for exceptional durability and strength. For starters, our Lion SD 50 Security Door is anchored to the wall with 12 reinforcement bars. Rest assured that it is a sturdy barrier that will perform exceptionally well. The door is fitted with 15-amp micro-switch for automated lighting control. Clients can even choose pair it with an alarm kit for extra security. The optional alarm kit can be integrated into your existing burglary alarm system. 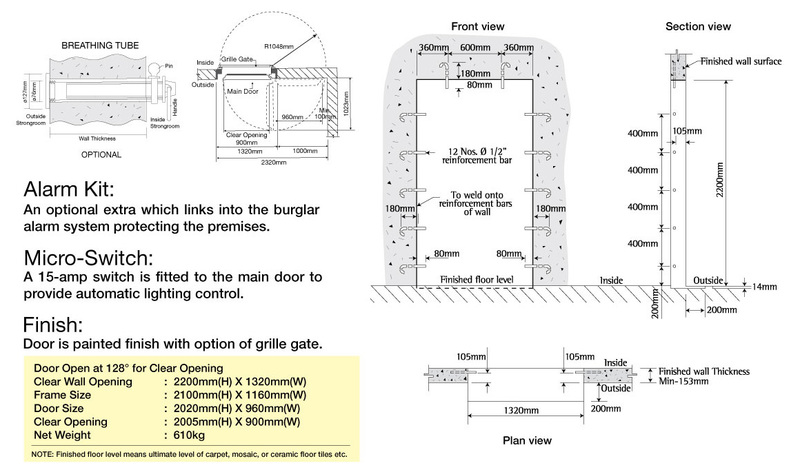 Customers can also choose to have an optional grille gate to be installed. With our Lion SD 50 Security Door, you can now enjoy peace of mind while focusing on what is important – your business. With Lion Steelworks, leave the heavy duty security work to us. For further information about our vault doors, contact us today. Let us show you why we are known to be some of the top steel security vault door manufacturers in Malaysia.